1.1 What Are Essential Oils? 1.6 How Do We Use These Oils? 1.7 How Many Types Are There? 1.9 Where Do We Find Essential Oils? 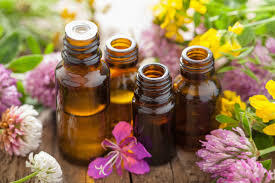 Essential oils are basically oils extracted from various plants : including the flowers, leaves, bark, roots, resin and peels, by various methods of distillation. The method of production/extraction determines whether the oils are cited as distilled or cold-pressed. People have been distilling nature’s plant life for centuries. 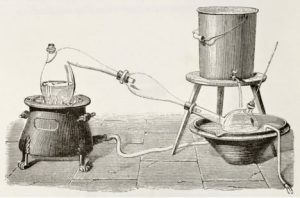 Paolo Rovesti was the one who discovered an earthenware distillation apparatus which it is assumed that it was used in the production or extraction of aromatic oils using steam. In the Middle Ages, a crude form of distillation was used to extract and prepare floral waters or distilled aromatic waters. These were used in perfumes and as digestive tonics, also in cooking and general trading of commodity. In 900 AD, Avicenna, a child prodigy from Persia who wrote many documents on plants and their uses and also instructions for massage, was accredited with refining the process of distillation by improving the cooling system. In our world today, the process of distillation is still the most common one used to extract essential oils from plants. The main advantage being that the volatile components can be distilled at temperatures lower than the boiling points of their individual constituents and are easily separated from the condensed water. During distillation the plant material is placed upon a grid inside the still. Once inside, the still is sealed, and, depending upon the above methods, steam or water/steam slowly breaks through the plant material to remove its volatile constituents. These volatile constituents rise upward through a connecting pipe that leads them into a condenser. The condenser cools the rising vapor back into liquid form. The liquid is then collected in a vehicle below the condenser. Since water and essential oil do not mix, the essential oil will be found on the surface of the water where it is siphoned off. Occasionally an essential oil is heavier than water and is found on the bottom rather than the top, such as with clove essential oil. The plant material comes into direct contact with the water. This method is often used with flowers (rose and orange blossoms), as direct steam causes these flowers to clump together making it difficult for steam to pass through. This method is used with herbs and leaves. During this process, the water remains below the plant material, which has been placed on a grate while the steam is introduced from outside the main still (indirect steam). This method is the most common method. During this process, steam is injected into the still, usually at slightly higher pressures and temperatures than the above two methods. This is a fairly new method, yet is similar to steam distillation except that the steam comes in through the top rather than the bottom, and there is a shorter distillation time. It is useful in extracting the oils from woody or tough material or seeds such as fennel and dill. *Please Note: The addition of essential oils to water is not the same as true hydrosols. It is suggested that you read the ingredients label on products to see what you are getting – whether or not it is a true hydrosol. When water and the oils are mixed together with or without a dispersant, this is called a “spritzer” or “aromatic spritzer,” and this product should not be confused with a true hydrosol. Another name for cold-press is expression. This method is expressly used when extracting citrus essential oils like : tangerine, lemon, bergamot, sweet orange, and lime. In earlier times, expression was done in the form of sponge pressing, usually by hand. The zest or rind of the citrus would first be soaked in warm water to make the rind more receptive to the pressing process. A sponge would then be used to press the rind, thus breaking the essential oil cavities, and absorb the essential oil. Once the sponge was filled with the extraction, it would then be pressed over a collecting container, and then allowed to stand for the separation of the essential oil and water/juice. The essential oil would then be siphoned into containers. A more modern and less labor-intensive extraction method, is the ecuelle. This process involves a prodding, pricking, sticking action to release the essential oil. During this process, the rind of the fruit is placed in a container with spikes that will pierce the peel once the device starts turning. The puncturing of the rind releases the essential oil which is then collected below the container. Most modern cold-pressing techniques are accomplished by big machines using centrifugal force. The spinning in a centrifuge separates the essential oil from the fruit juice. It is best to use essential oils with a carrier oil. The more common carrier oils are olive, coconut, and jojoba . Using the oils by themselves can sometimes result in ‘burns’ on the skin or wherever they may be applied, due to their strength in composition. There are many different types. 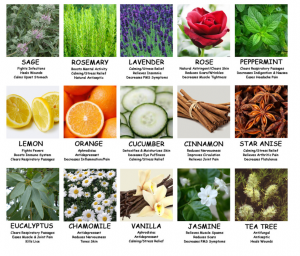 As many plants, as are existing, is there a possibility to have an essential oil. The oils can be pure unadulterated or they can also be mixed together – a very powerful concoction. Using these oils for healing reasons date back from earlier times and is based on Ayurveda beliefs. It has been found that the Western world is not a great advocate of using Ayurveda in comparison to the Eastern world – the Asian and Indian cultures are awash with constant use of Ayurveda benefits. It is only in the last few years that the benefits are being recognized. Where Do We Find Essential Oils? This is a very good question. There are specialty shops – online and physical locations which specialize in the selling these oils – their livelihood, if I may say so. These shops tend to know a host more of the uses and effects of the oils. They can be bought over the counter and do not need a doctor’s prescription unless it is being prescribed by a doctor of Ayurvedic medicine/homeopathic/alternative medicine. Thankfully the ‘power’ of essential oils are now being recognized in today’s world and more people are turning towards their use for healing and other benefits. As a user of Ayurveda medicine myself, I think the less intrusive a healing method we use for our healing, the better it is for our bodies. What are your thoughts on Essential Oils ? Have you ever tried any? I look forward to your feedback. 1/Guenther, E. (1982). The Essential Oils. Melbourne, Fl: Krieger Publishing.